I first bought this on vinyl on Island Records’ budget HELP label for something like £1.49 in 1974, a couple of years after it first appeared. My current copy is a CD on the boutique Fledg’ling label (FLED3037). I got it largely because it featured three former members of the ground-breaking ‘Liege and Leif’ line-up of Fairport Convention (Ashley Hutchings, Richard Thompson and Dave Mattacks) along with a couple of others, (Barry Dransfield and John Kirkpatrick) who I didn’t know at the time. This album was also the first time I heard the great English traditional singer Shirley Collins (credited as Shirley Hutchings because she was, at the time, married to Ashley) who provided vocals on a couple of tracks. 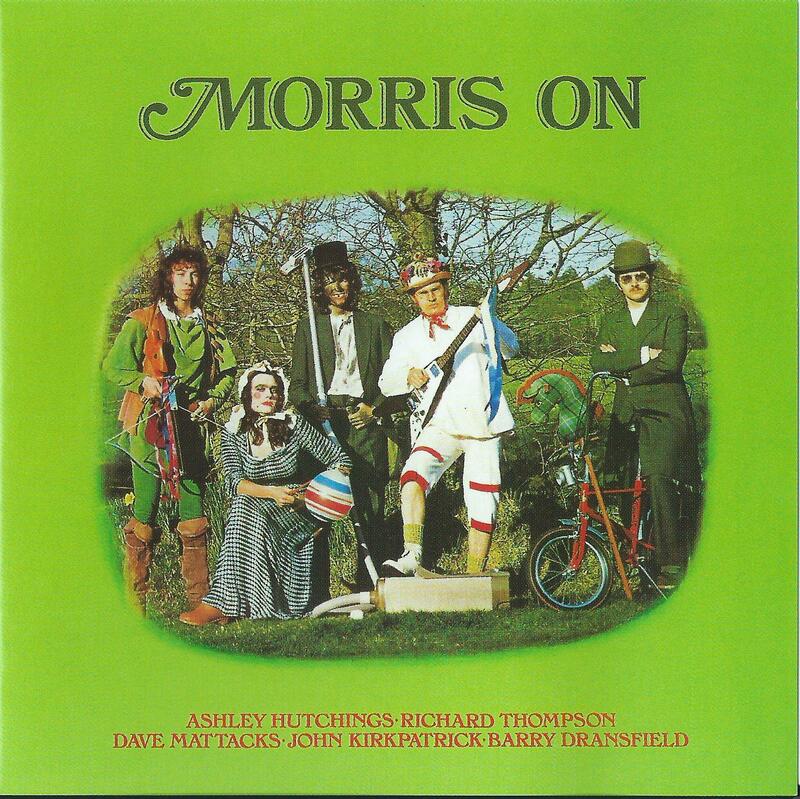 In its own way ‘Morris On’ is no less remarkable than ‘Liege and Lief’ because what Ashley Hutchings did (and while the album is credited to all five principals, it was Hutchings who assembled them and put the project together). This was to record twelve traditional morris dance tunes using their traditional accompaniment of fiddle and concertina supplemented by a rock trio of electric guitar, bass and drums. This sounds pretty simple now – but nobody had ever thought of it in 1972 and it worked surprisingly well! Morris dancing – and the music that supported it was, at the time, deeply unfashionable – but this project exposed it to a rock audience. While it didn’t make it fashionable, it did help kick it out of a reverential, respectful ‘preservationist’ men-only custom into a more open and enjoyable revival of the tradition which continues to this day! For readers outside the UK it may be necessary to explain that morris dancing is a traditional English custom, going back at least to the 15th century, in which men (and back then, it WAS just blokes), drink beer in between undertaking formation ensemble dances – generally in the open air. They are often dressed in white, sometimes wear bells on their knees and wave white handkerchiefs or large cudgels or swords, depending on local tradition. Some sides also perform with blacked-up faces – although since the custom goes back way before Britain became multi-cultural, there are no modern racist connotations). The word ‘morris’ appears to be derived from ‘Moorish’ and may relate to the expulsion of the Moors from Spain in the 15th century. The players sound like they had a great time – it’s energetic, exuberant, good-humoured and slightly eccentric. The tunes chosen are deeply evocative of rural England and the recording was done ‘as live’ – which gives it a homespun sound – complete with false starts. They even brought in a morris side to perform a couple of stick dances as the tape rolled. Pretty much every time I play this I end up smiling and humming along!